The Chapel dedicated to St. Martin and frescoed by Simone Martini in the 14th-century is certainly one of the masterpieces in our Basilica di San Francesco. St. Martin of Tours, 4th-century saint, is pictured as he gives his cloak to a freezing beggar outside the walls of Amien. According to legend, the beggar will reveal himself as Christ. The association is there: St. Martin, the bringer of warmth. L’estate di San Martino (“The summer of San Martino”) denotes good weather and warmer days following an early freeze (the “Indian summer” in Anglo-Saxon cultures). An inordinately warm fall this year (with resulting strong winds, floods and all sorts of meterological anomalies) means that this November 11th, la Festa di San Martino will not fall during un’estate di San Martino since our first freeze has not yet arrived. In rural cultures, the mezzadria (share-cropping) contracts were stipulated during the period of l’estate di San Martino, with termination of some contracts, the renewal of others. At this time, farm families might move into a farmhouse on another farm; in fact, “fare San Martino” means “to make a move”. An old Italian proverb announces the Saint’s feast day as the time to slaughter the pig and enjoy wine, “San Martino, uccidi il maiale e bevi il vino”. That might have been possible years ago – when November brought the cold weather needed for the curing of prosciutto. A Piedmontese saying, “Oche, castagne e vino, tieni tutto per San Martino.” (“Geese, chestnuts and wine, save it all for San Martino”) refers to the period before Advent when farm families indulged in abundant meals before the period of “lean” prior to Christmas. And legend says that when St. Martin was elected bishop of Tours, he hid in the countryside, preferring the contemplative life. A flock of screeching migrating geese revealed his hiding place. Wine consistently stars in the many sayings of this feast day. “Chi vuol far buon vino, zappi e poti a San Martino” (“For a good wine, hoe and prune at San Martino”); that is, the vines should be pruned after the grapes are picked and before new growth. We’ll be at farm friend Peppa’s to renew this tradition. Before putting the chestnuts on the stovetop, Peppa washes them and slits the peels in brisk downward strokes so that the stove heat penetrates each chestnut. As they roast, the chestnuts swell and blacken. Now and then, one will burst with a “pop” At just the right moment, with what I call “asbestos hands”, Peppa scoops the scorching chestnuts right off the stove top and drops them into a towel laid out on the table. She rolls them in the towel, crushing them with force. Then she proudly pours out a glass of her new wine, waiting for our opinion on its quality. We’ll look forward to tasting this year’s new wine wine – with that rich flavor of roasted chestnuts which marries so well with the frizzante spark of the vino novello. 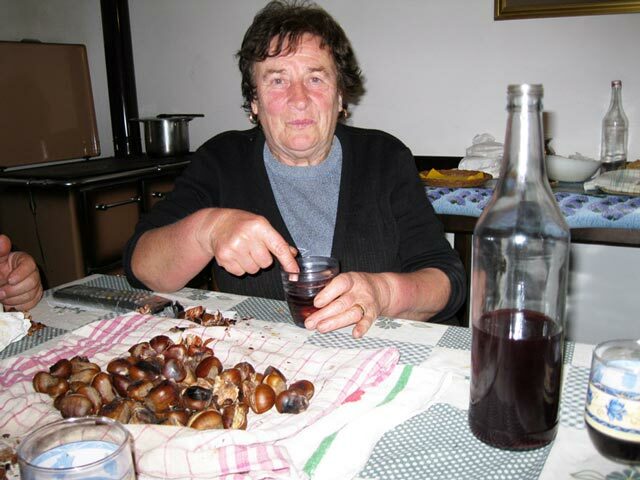 Peppa puts the roasted chestnuts right into a glass of her vino novello. “Squisito!”,she always exclaims jubilantly. Nowadays, the sharing of wine and roasted chestnuts is enjoyed in town piazzas as well as in farmhouses. At any November culinary festival, there will certainly be a stand offering chestnut flour, chestnut spreads, chestnuts with vino novello and not only: chestnut-stuffed ravioli and roast goose with chestnuts might be on the menu – with chocolate-dipped chestnuts for dessert.